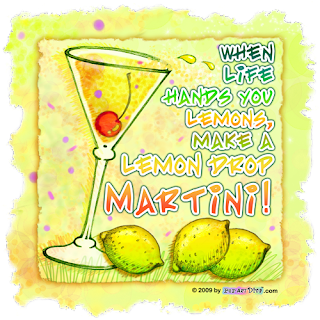 This LEMON DROP MARTINI Art available on posters, clothing, home decor & more here. Around the time I started kicking up my heels in platforms and dancing to disco music under mirrored balls, a cocktail revolution was under way in San Francisco. It was 1970 and Perry's (of Armistead Maupin's 'Tales of the City' fame) and Henry Africa's (established by Norman Hobday to take the "opium-den. . out of saloons") were turning the traditional bar scene upside down by changing dark, nineteenth century male drinking establishments into living room style, coed cocktail destinations with the homey atmosphere of antique lamps and furniture. Live ferns were the hip houseplant of the day, so greenery was plentiful and close enough to tickle your nose while you sipped your cocktail. The "fern bar" had come to Happy Hour and Bay Area residents were the first to experience a phenomenon that would sweep across the country, give birth to chains like T.G.I.Fridays and Houlihan's, and turn five o'clock into an entirely new, youth oriented social experience. Green plants, bell bottom pants, flower power and happy hour melded together and brought a whole new generation to cocktail-dom. The dark, smoky male dominated saloon gave way to a thinly disguised "meet" market where the children of the "three martin lunch" generation gathered to get down, get funky and - let's be honest here - get laid. My mother had enjoyed her cocktails in famous ballrooms listening to big bands, dressed in elegant cocktail dresses, awash in sparkling sequins and hi-balls. Decades later my sister dressed in black leotards and baggy black sweaters and met up with her hipster crowd in dark, coffee houses to listen to would be beat poets while surreptitiously pouring a splash of cognac or brandy in her coffee cup. I had Lemon Drops at Henry Africa's and Harvey Wallbangers at Perry's in The City and boogied down with wine spritzers and Tequila Sunrises at local joints in the San Jose area like The Bodega, Gilbert Zapp's, Reuben's Plankhouse and Mountain Charley's dressed in bell bottoms, hot pants and platforms, crowned with a frizzy red, honky Afro. The times they had a-changed. From the speakeasies and flasks of the twenties, the ballrooms and tuxedoed waiters of the forties, the coffee houses and spiked caffeine of the fifties and the business man's lunch with the three drink appetizers of the sixties, cocktails came into the light in the "liberated" seventies afloat in the ambiance of Tiffany Lamps and antiques, ferns and the first of the designer cocktails. The era of the yuppie Happy Hour had begun, complete with pre-Aids sexuality and free nachos on platters. I spent Friday nights in my twenties in the latest, hip fern bar of the week with my gal pals, raising hell, trolling for men and ordering the latest libation to spill forth from 80 proof bottles. 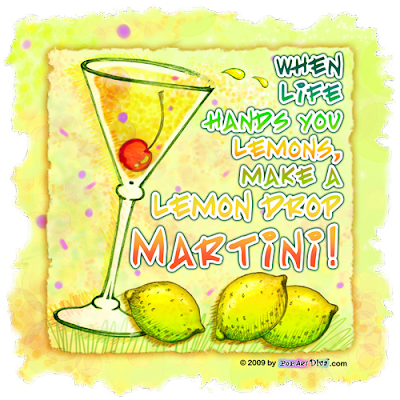 I didn't know it at the time, but I experienced my very first designer martini when I took a sip of The Lemon Drop at Henry Africa's where it was created in the 1970s. Henry Africa's is long gone - Hobday closed it in 1986 and opened Eddie Rickenbackers where, as far as I know, he still hangs out with his cat watching a TV in the corner. The last time I looked, Perry's had become an upscale restaurant on the Embarcadero. The Lemon Drop lives on as an Elder of the Designer Martini Tribe and I took my fern bar-hopping experience and grew up into The Martini Diva. The times, they are still a-changin'.